Monday was a cool day for our little military adventure. Parker got promoted to Lieutenant! Before I go any further, can we all take a second and agree that "Lieutenant" is a really hard word to spell? Great, thanks. We knew the promotion was coming but found out just a couple of days prior that it would be on Monday. I quickly blocked out the hour at work, Parker dusted off the khakis, and we were promotion ready! 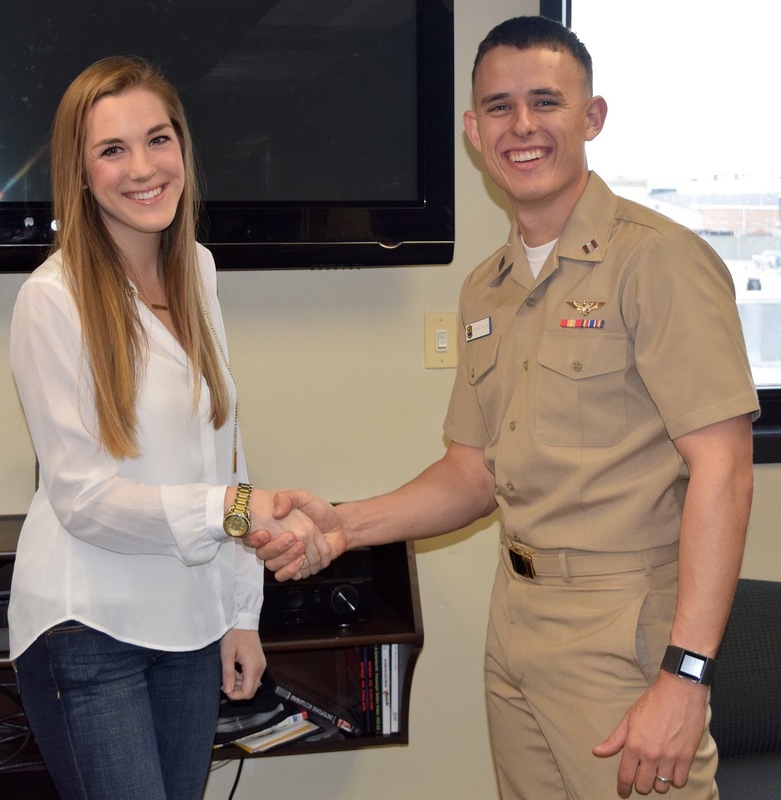 Some squadrons make a really big deal out of promotions while others keep it short and sweet. Parker's squadron does the latter, but it was still special to us and celebration-worthy. 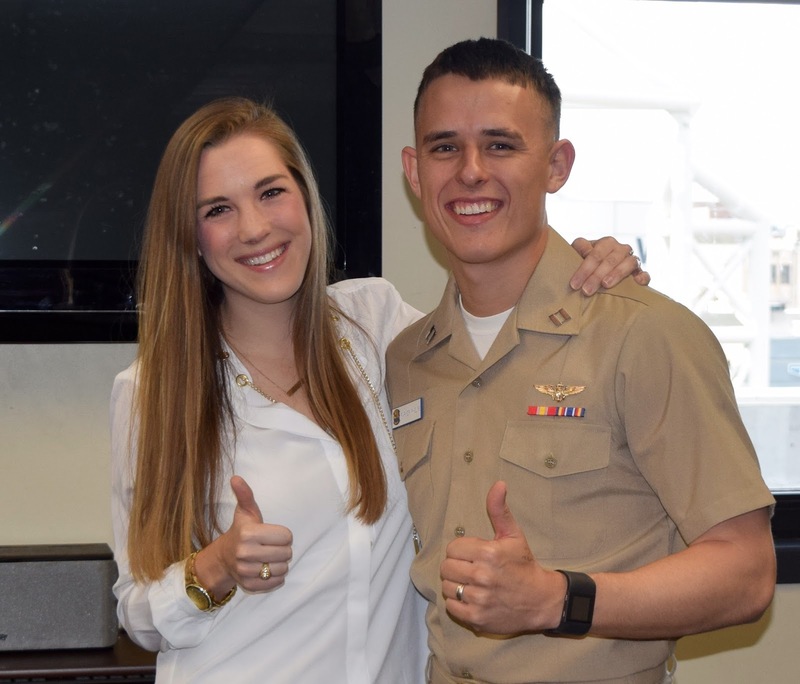 One of Parker's peers was also promoting, so they said the oath together in a repeat-after-me fashion with the Commanding Officer. Then, it was my turn to pin on the new ranks. I must say, those new Lieutenant bars look pretty snazzy! I love that I get to be included in ceremonies like these. Most squadrons are really good about including the wives, and this one has been no exception. 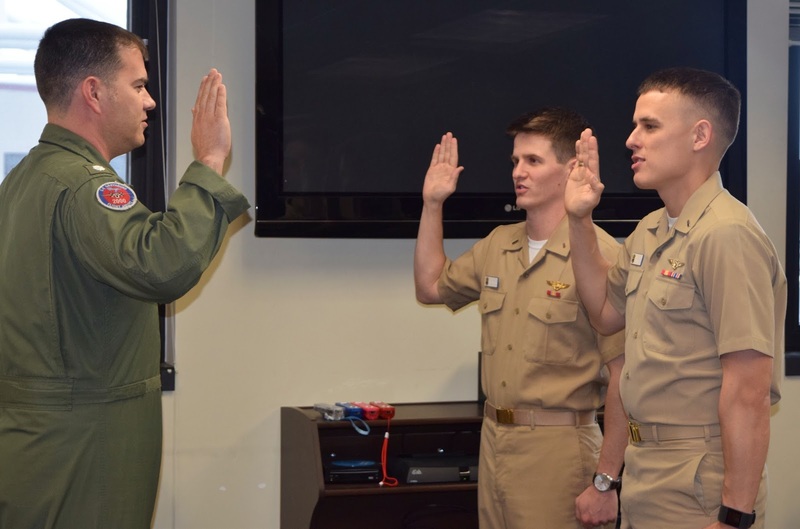 From pinning at the commissioning to wings to his first promotion to LTJG, I've gotten to do them all. We both agree military life is a team effort. 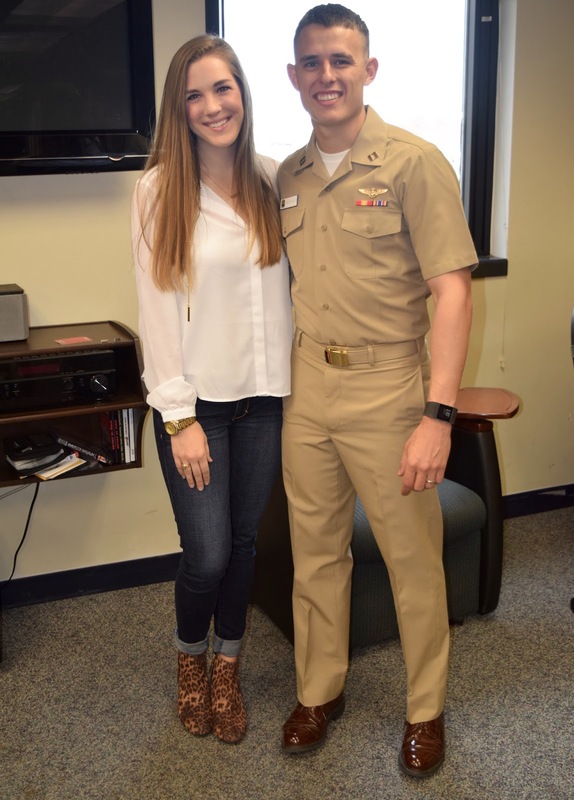 He earned this promotion completely on his own, but support is so important for these guys. Their jobs are stressful, their hours are long, and I've learned that it's my job to keep life as easy as possible on the home front to accommodate. Teamwork makes the dream work. I love this next picture, because we both just instinctively threw up the "gig 'em". Once an Aggie, always an Aggie. We don't really know how to pose for a picture in another way. Thank goodness for the always classic "gig 'em". What does the rest of the world do with their hands?! True to Parker and Chelsea form, we had to shake hands at the conclusion of the promotion. Here's the back story on this one: At Parker's commissioning ceremony 4 years ago, there were several of us on stage with him. His parents, me, and several officers leading the commissioning. It's an exciting yet nerve racking few minutes when it's your (Parker, in this case) turn to commission, because all eyes are on you, and this is your first rodeo. After we revealed his new ranks, he turned to shake a few hands and shook mine with them. I was his wife, and typically a hug is more the standard. There was so much going on, that he didn't pay attention and accidentally shook my hand. We've had a good laugh about this ever since! Every few weeks, one of us will go up to the other, extend a hand, and say "Congratulations on your commissioning". My husband will be so thrilled to read that I have included this little anecdote for the world to see. Just keeping it real, yall. On a serious note, I could not be more proud of the man I am married to. It doesn't matter to me what rank he is, but it was neat to see this new rank pinned to symbolize 4 years of hard work on his end. I've never met someone more passionate about what they do or more optimistic about the every day than this guy. He chooses joy in everything he does and sees the positives in so many not-so-positive situations. These past 4 years of military life have been a wild adventure, and year 5 will be the biggest one to date, but we are loving every minute of it. So proud of the newly named LT Phelps! On the last picture, see what I mean about the hands? Awkward dangling arms, party of 2. When in doubt, throw up the "gig 'em". It's just better. Congratulations :) That is awesome! So great you got to be there for it too. Aww congratulations! What a wonderful achievement!! I LOVE how you share your story with us!! Seriously y'all are such an inspiration as a couple for this single gal!! Thank you for sharing this with us and congratulations again!! Congratulations on the promotion! That is so exciting! And so awesome that he loves his job! i love short and sweet, any pinning ceremonies on my husband ship normally last an hour and a half since they tend to do every rank at once. Congratulations to Parker, and congratulation to you both on being such great teammates for this thing we call life! Congratulations to Parker! It's so nice that you are able to be a part of his ceremony. Congrats to Parker!! What an accomplishment, and I know you are so proud! 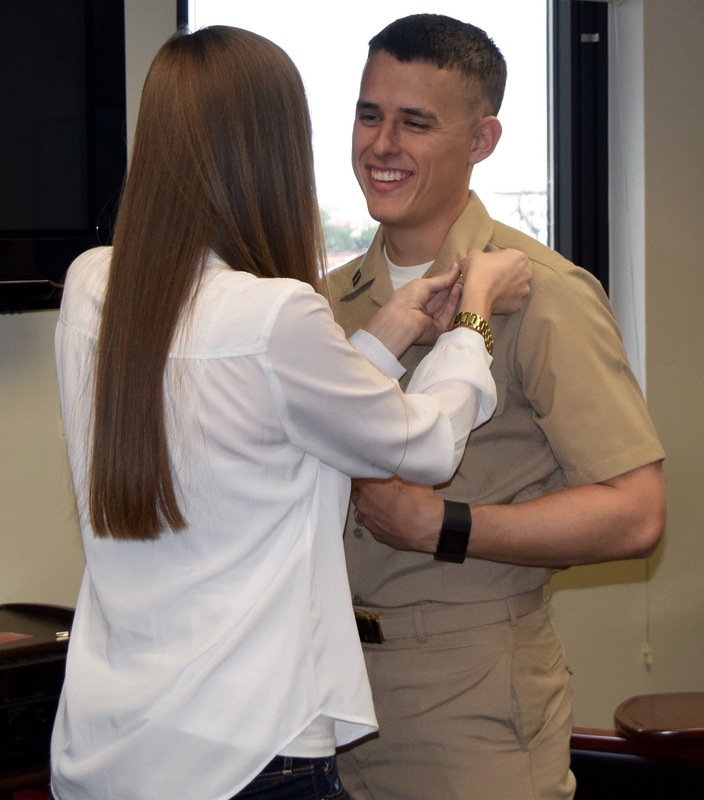 I LOVE the picture of you pinning on his new ranks, so sweet! The hand shaking story is so funny, glad y'all are able to still mess with each other about it. Congratulations!!! That is so exciting. I love the hand shaking story - so funny. Congrats Parker!!! Such a wonderful accomplishment. :) Kudos to you as well for being such a huge support. Congrats, Parker and good job to you for being such a dedicated wife. But seriously, when it doubt, give a gig 'em! Your outfit is perfection as well! Lookin' snazzy with the double bars, Phelps! Congrats to Parker, that's so awesome! I love the story behind the handshake, so cute and so funny! Congratulations to Parker! And seriously -- those booties are AMAZING! Isn't it so weird to always throw up a gig 'em? Our entire family catches ourselves doing this taking photos. I actually have to tell Dannika to pose just "normal", but I guess living in Aggieland, the gig 'em thumb is normal. Congrats to your husband!!! that is soooo dang exciting! You guys are just so cute together. Congrats to you both! Congrats to Parker! My camera died during Mac's promotion to Captain. Whomp whomp. Aw, congrats to Parker! How fun! In the Air Force, Lieutenant (well, Second Lieutenant) is the first officer rank, and I agree... it takes a while to get used to the spelling! I also love the little handshake story - too funny, and I'm sure it'll be a funny memory for you guys forever! So sweet for you to be part of that. I have loved being part of Tom's. Congrats to Parker!